The neo-Nazi Golden Down is quiet at the moment in Greece, with its leadership in prison cells but somehow fascism is finding other ways to enter the Greek political life and I’m afraid that this time it is not only Greek trait but also an international attitude. It all started while the neo-Nazi Golden Dawn case was in its peak. 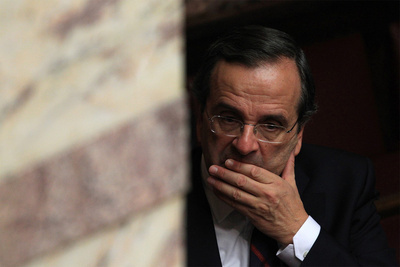 Suddenly the Prime Minister Mr. Samaras and members of his close court started unveiling the theory of the two edges. And if the Golden Dawn was holding the one edge everything on the left was communist, therefore supporter of Stalin so the other edge. Now this was obviously not enough for Samaras and since the Golden Down was officially a criminal organization with one proven murder at least in her file, the left had also to be a criminal organization and if you ask for a murder, well Stalin had done so many! The theory of the two edges. It is also important to remember that the left alliance SYRIZA in Greece is storming for a victory in the next elections and is the main opposition of the losing Samaras and the conservative party. This is a very dangerous game with a lot of implications. After proving that a neo-Nazi party is a criminal organization, danger for the public and the country’s security, emulating them with the ideological opposition and future winner in the elections for one thing divides the people with unexpected consequences. What will really happen the day after? When the left alliance would try to take over the government. There will be people with weapons in the streets ready to defend the country from a criminal organization? And what will happen if one idiot, one crazy person decides to give a solution now by killing the leader of the opposition? Just to save the country? What will happen during the campaign period when nerves and passions will be tense? And then gives an alibi and an excuse to the neo-Nazis for their actions. Stalin was a dictator who did crimes and he covered his crimes under the communist ideology, but his connection with a communist state as Marx dreamed about it, was the same as Pinochet practiced democracy in Chile. Oddly Pinochet did call it democracy and he was not the only one, Franco was a democratic leader in Spain, or at least that’s what he thought; Idi Amin was talking about democracy in Uganda, Mugabe is talking about democracy now in Zimbabwe and al-Assad in Syria. Actually Stalin’s ruling is called Stalinism for the obvious reasons but who cares for these details when it comes to the opposition that might take you from the power. Actually and whatever I might think about Stalin, I cannot connect people like Enrico Berlinguer with him. In a case you don’t know, Enrico Berlinguer led the Italian Communist Party from 1971 till his death in 1984. A soft spoken politician, very educated and most importantly a pro-European, much more pro-European than I will ever be. Actually he had very bad relations with the Soviet Union and the invasion to Afghanistan in 1980 made him furious. And this is just an example, from Finland to Greece I can think of tens known communist leaders and hundreds of anonymous supporters who hated Stalin probably more that their conservative compatriots because they felt that Stalinism was harming their cause. But then again Samaras has not to deal with the Communist Party in Greece, but with the left alliance. Something totally different that includes from socialist, environmentalists, centre-left, to euro-communists. This actually proves Samaras lack of ideological arguments and his slip into fascist methods shockingly using the theory of collective responsibility theory, very familiar to Nazis. So his world is shared into them and me. Me, the god of the good and everybody else the evil, the criminal. Sad to say but he definitely needs psychiatric help. However the man is the prime minister. The majority of the conservative MPs and politicians keep their distance from this theory aware the dangers hidden behind. But Samaras is the man who decides their political future and under the general circumstances in Greece this moment nobody is ready for a political coup inside the party. Is just what I said before, what will happen if a lunatic takes him seriously? But as I said in the beginning this is not a Greek trait and lately more signs of this two edges theory has appeared in European, mainly conservative parties even European leaderships and government like in Hungary and Poland and the Nazi collective responsibility theory has become their ideology flag and only argument. Best example, Estonia. It is a fact that Estonia didn’t have good times during the Soviet Union era and many suffered that period. But the government today, over twenty years after the end of that era and following the logic of the collective responsibility, punishes the Russian minority who was forced 80 years ago and now in her fourth generation, to move there. We are talking about 320,000 people living in conditions of hate and cast as second category citizens with limited rights. Just because they are Russians therefore Stalin’s compatriots and heirs of his crimes. So while we try to put neo-Nazism into prison cells thanks to contemporary politicians like Antonis Samaras, fascism takes central stage.